Cambridge HOTmaths is a comprehensive mathematics learning system – an interactive online maths learning, teaching and assessment resource for students and teachers, for individuals or whole classes, for school and at home. A suite of flexible resources (printable and online) is provided for all types of classrooms ranging from those with no technology to full laptop access, and includes projectable material in all lessons for interactive and non-interactive whiteboards. Developed by a dedicated group of educators, technicians and designers, Cambridge HOTmaths is a high-quality maths resource for students and teachers. Since joining forces with Cambridge University Press in 2009, a range of products have been published with integrated digital resources powered by Cambridge HOTmaths, including Essential Mathematics, Cambridge Senior Mathematics, ICE-EM Mathematics Third Edition and CambridgeMATHS Stage 6. These products deliver a host of interactive features to enhance the teaching and learning experience, and when connected to a class teacher account offer a powerful Learning Management System. Are you looking for Essential Mathematics Second Edition or Cambridge Senior Mathematics? Explore teaching and learning tools including lessons, walkthroughs, questions, animated demonstrations, worksheets and solutions, working mathematically investigations, the maths dictionary and our online maths competition. Enter your email address to start your trial today! If you are a teacher, we can extend your free trial for a school term, or organise a whole-class trial so that you can explore the full benefits of HOTmaths. Access widgets, walkthroughs, questions and Scorcher in each sample lesson listed below. Some functionality is available only to subscribers. 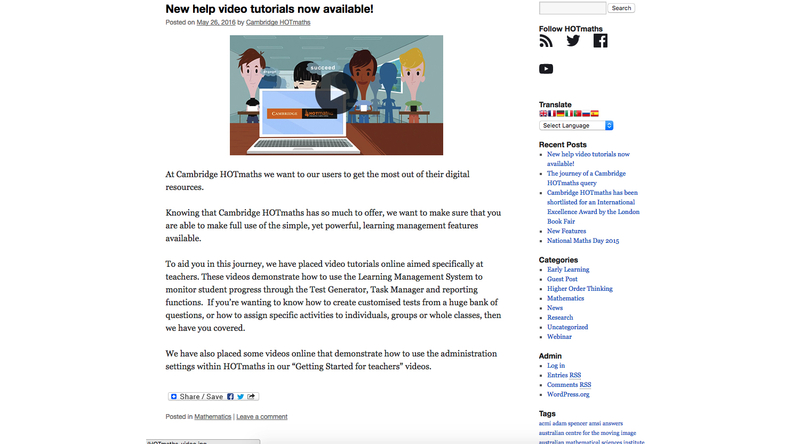 A Cambridge HOTmaths subscription provides you with access to all resources for Foundation to Year 10, including the learning management system. Teacher accounts are available for $149.95. Contact us for more information. Visit our blog to hear all the latest news and ideas. To share your story please contact us. Teachers, see the full benefits of HOTmaths. We can also organise a class trial for you and your students, plus we'll extend your free trial for a school term! A suite of flexible resources (printable and online) are provided for all types of classrooms ranging from those with no technology to full laptop access, and includes projectable material in all lessons for interactive and non-interactive whiteboards. Developed by a dedicated group of educators, technicians and designers, Cambridge HOTmaths is a high quality maths resource for students and teachers. In September 2009 Cambridge and HOTmaths combined forces to offer cutting-edge technology and best practice to support mathematics teaching and learning in Australian and New Zealand schools. Cambridge University Press has since published a range of products with integrated digital resources powered by Cambridge HOTmaths, including Essential Mathematics, Cambridge Senior Mathematics, ICE-EM Mathematics Third Edition and CambridgeMATHS Stage 6. These products deliver a host of interactive features to enhance the teaching and learning experience, and when connected to a class teacher account offer a powerful Learning Management System. Cambridge University Press has been publishing high-quality curriculum-based materials for school students for over 150 years. It publishes across a range of subject areas including Mathematics, Business and Commerce, Information Technology, History and English. Cambridge HOTmaths is committed to the future of education in the region, and will continue to develop exceptional resources that reflect specific syllabus requirements and broader curriculum developments and incorporate educational change and technological innovation. Sharon joined HOTmaths in 2004, seeing it as a potential agent of change in mathematics teaching and learning. She has vast experience teaching in government and private schools in Australia (including being an inaugural staff member of Bradfield College) and in an international technology college in Brunei. Sharon lectured in teacher education programs, presented to teacher audiences, and has been active in mathematics professional associations for many years. Currently Sharon is involved in doctoral research on technology in mathematics teaching and learning at Macquarie University. Janine taught in NSW government secondary schools for 20 years. As a Mathematics Consultant for the NSW Department of Education and Training, she spent four years delivering professional development in both primary and secondary schools. For 3 years Janine wrote workbooks and online learning material for distance education students and she currently manages the content development for HOTmaths as well as writing much of the material. Rachel holds a BA Dip ED from Macquarie University and a Graduate diploma of Computers in Education. She has taught in Primary Schools in NSW for more than 20 years and has extensive experience in the area of gifted education. Rachel regularly provides professional development to teachers on the use of technology in the classroom and implementation of the Australian Curriculum. Would you like to see Cambridge HOTmaths being demonstrated live? You can watch our Professional Development webinars and lots more video content on youtube. Don't worry, these things happen. Just enter the email address you used to register with Cambridge HOTmaths and we'll send you a link to reset your password. If you have changed your email address since you registered please ask the teacher who administrates your school's Cambridge HOTmaths account to update your email and reset your password. If you have forgotten your username then ask your teacher administrator. If you still can't log in then contact us. Any notice given under this agreement must be in writing. Notices given to HOTmaths should be forwarded to contactus@hotmaths.com.au and Notices to be given to the Subscriber should be forwarded to the email address specified in the Application.